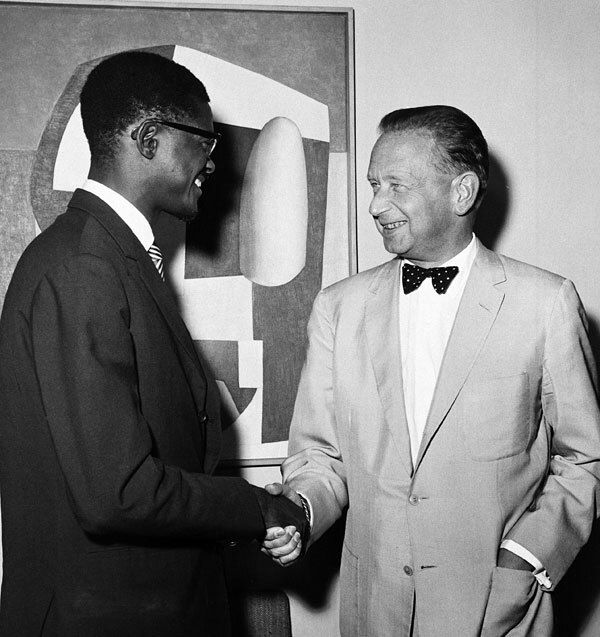 In summer 1960, then Secretary-General Dag Hammarskjöld welcomed a smiling Patrice Lumumba, the first Prime Minister of the Congo, to the United Nations. In one of the most under-rated images from the United Nations archives, we see the two leaders shaking hands, united in their view that the UN must ‘act’ to protect the sovereignty of newly-decolonized nations. They could not have known that their efforts to realize the promise of the UN through the peacekeeping mission in the Congo would destroy them both. Just two years later, Lumumba had been murdered by his political enemies, in collusion with Belgian and British secret forces. Hammarskjöld was killed in mysterious circumstances when his plane crashed en route to negotiate a peace settlement for the Congo. The crisis from 1960 to 1964 combined internal Congolese politics with the overarching process of decolonization against the backdrop of the Cold War which drew the super-powers into Africa. These years propelled the Congo into a devastating spiral of corruption, collusion, and catastrophe from which it has arguably never recovered. The assassination of Lumumba on 17 January 1961 was one of the most important turning points of the conflict. It led to widespread outrage among his supporters, not just in the Congo but among oppressed peoples around the world, for whom he quickly became a martyr for freedom. Communists, socialists, and advocates of the Third World cause from Cairo to Moscow publicly criticized the role of Belgium, Britain, and the United States in Lumumba’s assassination. Lumumba’s supporters widely believed his murder was a plot to ‘recolonize’ the Congo in order to control its vast supplies of natural resources. The secession of Katanga, a mineral-rich province in the south-east of the country, six months previously had been orchestrated with Belgian assistance. Following the assassination, tempers boiled over. When news of Lumumba’s death spread in February 1961, an angry mob broke into the UN headquarters in New York, threatening Dag Hammarskjöld with violence for not protecting Lumumba. For his part, Hammarskjöld had brought innovation and vigor to the post of Secretary-General. When he invoked his power under Article 99 of the UN Charter, Hammarskjöld established a precedent by bringing the Congo question before the Security Council in July 1960. This was the first time that the Secretary-General had brought an issue to the Council, which up to that point had responded to requests from states. He continued to play a role in formulating the subsequent Security Council and General Assembly resolutions that created the mandate for the UN peacekeeping mission, Opération des Nations Unies au Congo (ONUC). ONUC combined a massive military operation and large civil mission. Nearly 20,000 troops sought to reunite the province of Katanga with the Central Government in Leopoldville (now Kinshasa) through a military campaign. At the same time, the UN sent a large civil mission which acted as a state-building project for the country as a whole. However, the Congo mission was viewed by many countries including Britain and Belgium as exceeding the authority of the Secretary-General and the UN under Chapter VII. ONUC was comprised primarily of troops from neutral countries such as Ireland and Sweden but also relied heavily on contributions from non-aligned, anti-colonial African and Asian states such as Ghana and India. These representatives formulated and executed UN policy and enjoyed a close relationship with Hammarskjöld. Meanwhile, Britain and the US gradually discovered that the nature of the UN had changed. The atmosphere during committee meetings was more and more anti-colonial. Over time, Britain in particular experienced a diminishing influence over UN Congo policy, which was increasingly led by the anti-colonial actors in the General Assembly. As the mission proceeded, it became mired in conflict around the partisan role of the peacekeepers and the financial impact on the organization. Questions were also raised by opponents of the mission, including the Soviet Union, about how UN policy was made in New York. Bringing together these elements and identifying the different ways in which decolonization and the Cold War affected Congo policy offers a new perspective on the UN. The Congo crisis was not just a Cold War conflict but a key turning point in the process of decolonization. Following the political fragmentation and violence of Congo’s first attempt at self-government, many other newly-independent states in Africa and Asia feared their hard-fought freedoms may be transient. Holding up the Congo as the worst-case scenario for decolonization, they united to shape UN Congo policy and asserted their authority at the UN. In doing so, the crisis became a lightning rod in the broader interaction of decolonization with the Cold War. The Afro-Asian bloc took over the Congo Advisory Committee and the Special Political and Decolonization committee in an effort to use the Congo as a paradigm to determine the course and the pace of decolonization. A new UN investigation into Hammarskjöld’s death has called on Britain and the US to open their archives in order to definitively determine how the plane crash occurred. Given the multiple dimensions of the Congo crisis, and the remaining mysteries surrounding many of its major events, it continues to ignite the imagination of historians and the general public alike. The crisis consolidated the impact of decolonization as not just a process that transformed the world of empires into nation-states, but one which elucidated a wider Third World critique of the internationalism of the West. As the UN withdrew in 1964, plans were already underway to put General Joseph-Désiré Mobutu (later Mobutu Sese Seko) into power. He established a dictatorship in 1965 which led to the financial ruination of the country and its people for over three decades. The early years of Congo’s independence were not just another episode of the Cold War in the Global South. Rather this was a conflict of multiple dimensions which demonstrated the potential and the limitations of UN agency and Afro-Asian solidarity.